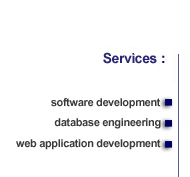 PeakPoint specializes in the design, development, implementation and support of custom software. Our services can be valuable for any business which requires development in areas such as GUI, client-server, database and internet/ e-commerce. PeakPoint will invest its own money to develop its products and services for targeted markets. PeakPoint may help your organization by sharing in development costs on specific products and services. Compensation typically comes from a royalty scheme based upon the sales of the products or services developed by PeakPoint.